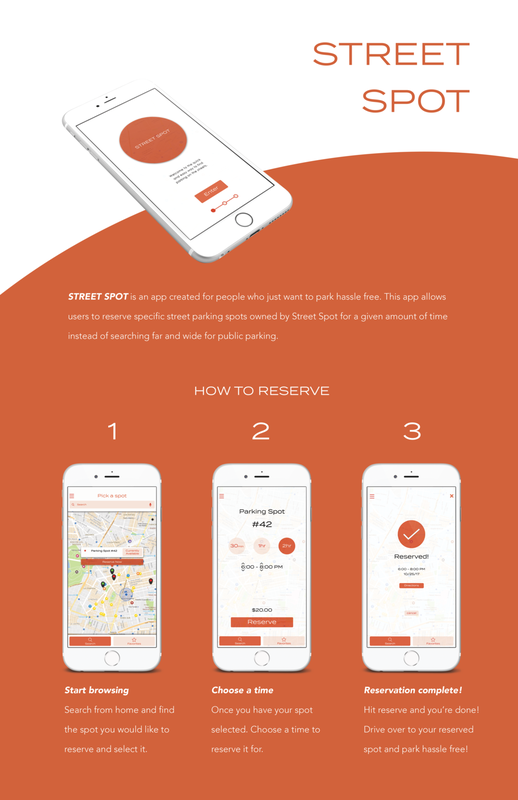 Street Spot is a completely new parking application. This application allows users to reserve specific street parking spots owned by street spot instead of searching for public parking. Problem: Inner-city street parking has become difficult and time consuming. It is estimated that drivers lose an average $1,200 annually due to "wasted time and fuel emissions." This is a substantial amount of money with no real solution, So I decided to develop my own application service that allowed users to book their own parking hassle free so that they would be able to find parking immediately. After reviewing my moodboard I asked my stakeholders to help provide possible criticism about the concept. I used their critiques to come up with a new proposal for this application. New Proposal: An application that would allow users to book and reserve parking in specific locations for a given amount of time before arriving at the spot. Customers who stay over the allotted time will be charged additional fees. I went back to the drawing board and started revising my sketches to fit an application that revolved around reservation based SaaS. This idea proved to be a more innovative solution to the problem that I wanted to address. Below I developed a demonstration poster showcasing the 3 simple steps of the application. Within the app you would be able to secure a time and location wasting no time at all. To top off this project, I also created a walkthrough motion graphics video to summarize how the usability of the app might look like. I condensed the amount of information so that the user would be able to grasp the main uses of the app such as reserving a spot and checking their user profiles.